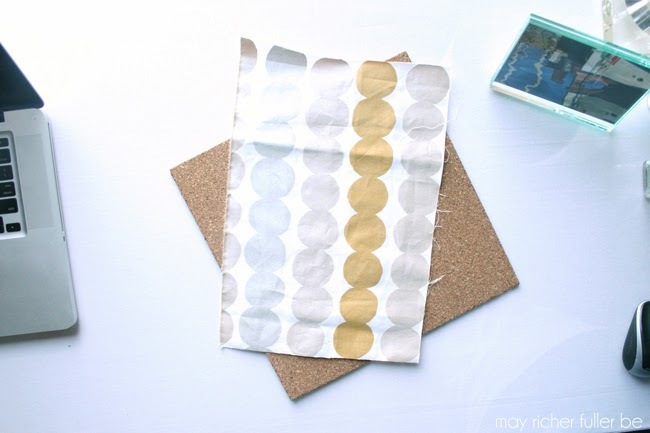 I've got one more little DIY project to share with you today from my mini office makeover - a pretty silver and gold polka dot mouse pad! 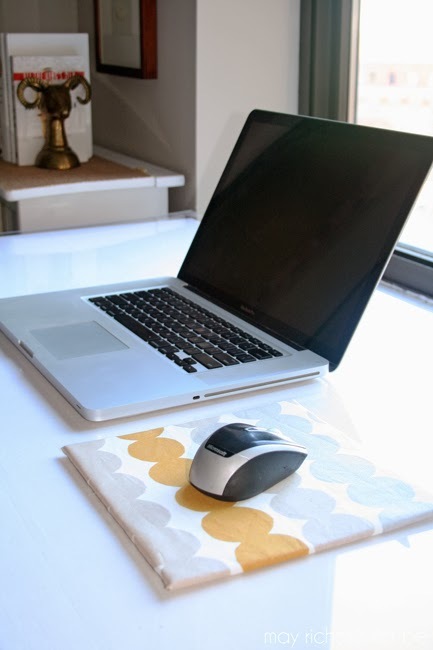 It's kind of essential for this desk because plexiglass and those little laser lights that tell the mouse where to go apparently don't mix :); therefore, the mouse won't work without a mouse pad. Instead of running to the store to purchase a generic, not-so-pretty one, I decided to make one myself using a fabric scrap. This project took me a total of about 15 minutes, and I used supplies I already had on hand, so to me this project was F-R-E-E. Hooray! 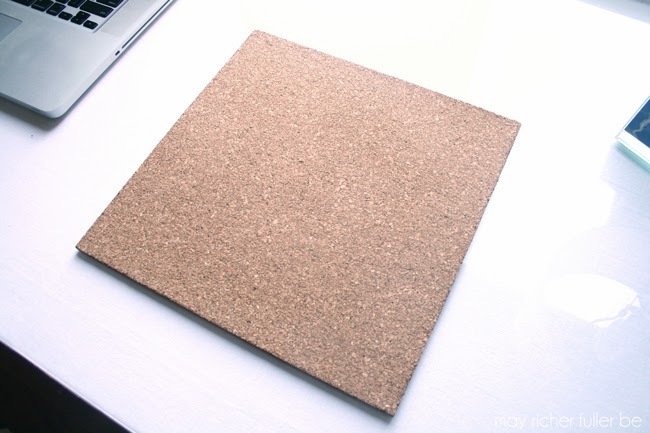 Step 1: Trim cork or foam sheet to an 8x8 inch square. Step 2: Trim fabric to 9x9 inch square. If needed, iron the fabric at this point so that it's free of wrinkles. 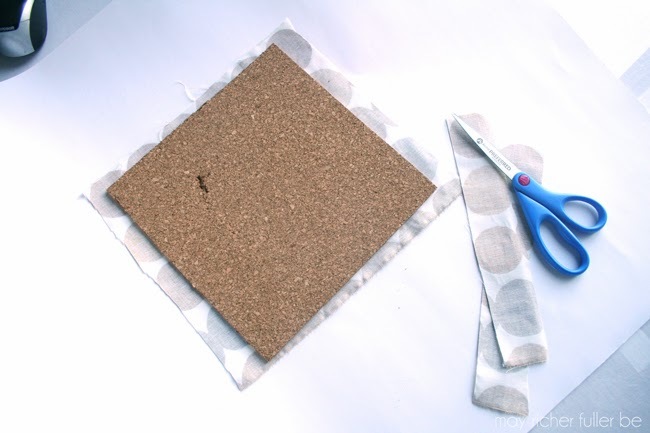 Step 3: Hot glue the edges of the fabric to the underside of the cork piece. 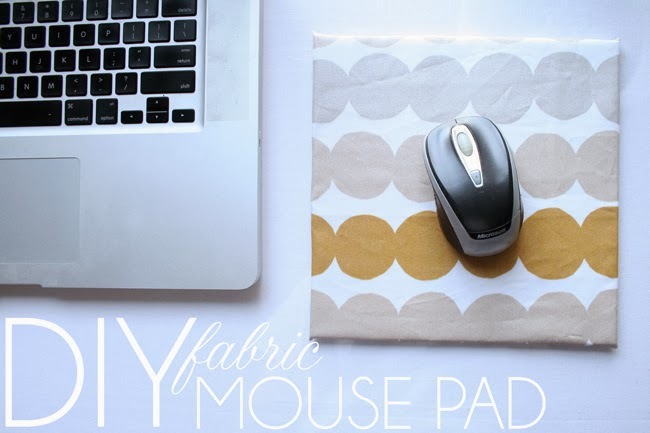 Make sure to pull tight in each direction so the fabric is taut otherwise it won't be a very smooth surface for the mouse! 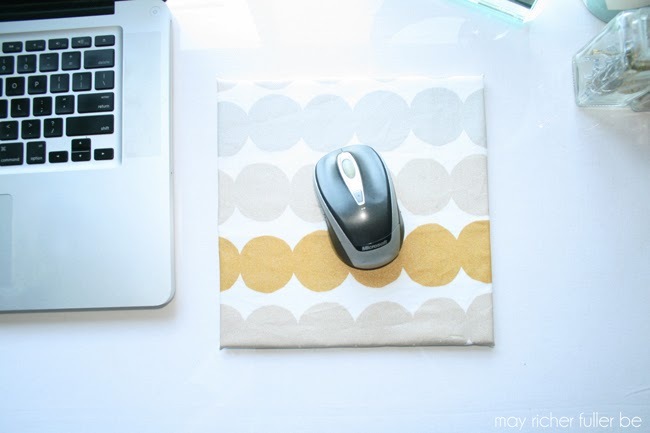 Trim the excess fabric from the corners and glue down the bits of remaining fabric so that the mousepad will lay flat. To make sure the mouse pad stays put while you use it, dab a small dot of hot glue onto each of the four corners on the underside. Allow the glue to dry, then flip it right side up. Those glue dots will keep it in place while you move the mouse around. All done! I now have a pretty mouse pad to look at while I'm working on my computer! 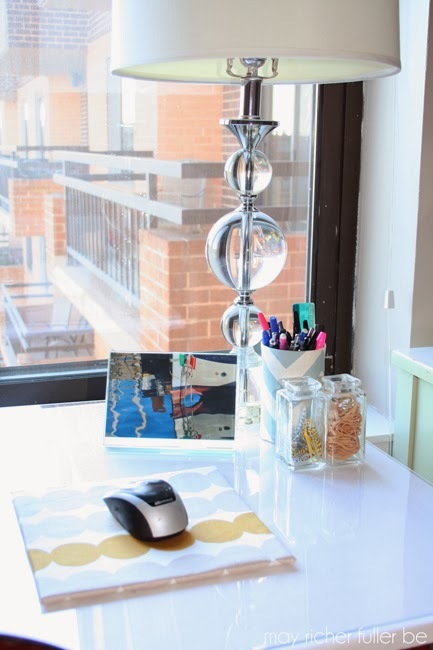 Hope you've enjoyed seeing the mini-makeover of my office nook area over the past few days. 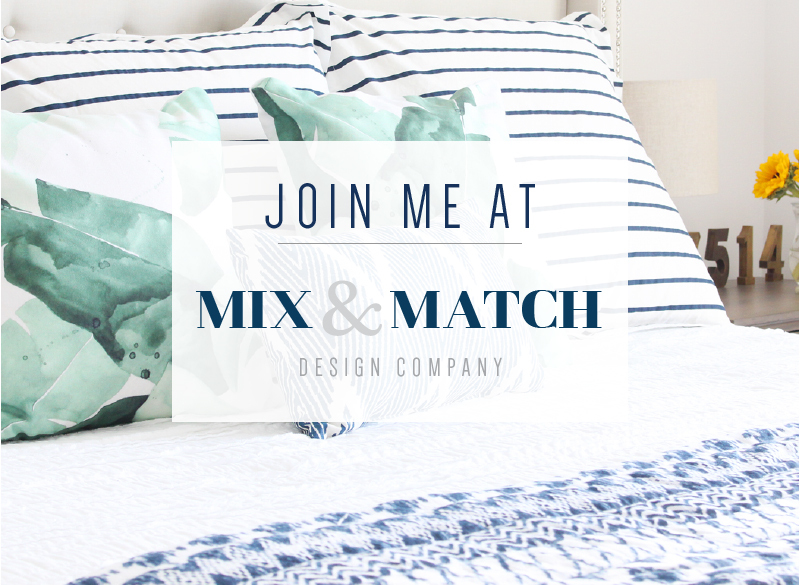 If you have any questions, leave me a comment and I'll be sure to be in touch! 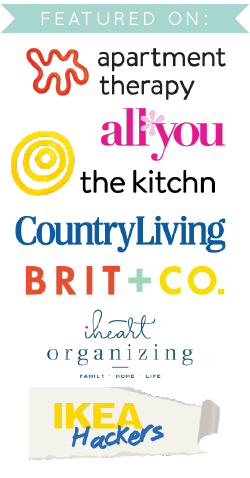 Stay tuned tomorrow - I've got an exciting announcement to share about some new products for CSW Designs! So cute and simple! I love that type of project! 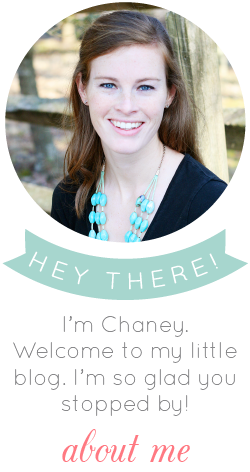 Thanks for sharing, Chaney! I might just have to do this. I have a magic mouse (not to be confused with a Magic Mike), and it is supposed to work on any surface. But REALLY, it doesn't. Thanks for the inspiration! So smart and really cute! Love it!